Few missions of planetary exploration have provided such rewards of insight and surprise as the Voyager flybys of Jupiter. Some of the spirit of excitement and connection is captured in this volume. Its senior author was a member of the Imaging Team. The pictures in this publication are a part of the rich harvest of information returned by Voyager 1. These images are of great beauty as well as great scientific interest, reminding us of the breathtaking dimensions of the solar system we inhabit. Pioneer 11 made the first flyby of Saturn almost a billion miles from Earth where it came within 13300 miles of the cloud tops. Assembled in this publication is a selection of the pictures returned by Pioneer 11 of Saturn and its largest moon, Titan. A trans-Neptunian object is any minor planet in the Solar System that orbits the Sun at a greater average distance (semi-major axis) than Neptune. The Kuiper belt, scattered disk, and Oort cloud are conventional divisions of this volume of space. Mars Science Laboratory is a robotic space probe mission to Mars launched by NASA, which landed a rover Curiosity. The objectives include investigating Mars' habitability, studying its climate and geology, and collecting data for a manned mission. 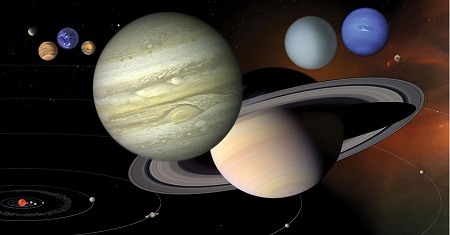 The Solar System comprises the Sun and its planetary system, as well as a number of dwarf planets, satellites, and other objects that orbit the Sun. It formed 4.6 billion years ago from the gravitational collapse of a giant molecular cloud. This book surveys the current state of knowledge of the solar system and recommends a suite of planetary science flagship missions for the decade 2013-2022 that could provide a steady stream of important new discoveries about the solar system. The text covers the theory of planet formation with an emphasis on the physical processes relevant to current research. After summarizing empirical constraints from astronomical data we describe the structure and evolution of protoplanetary disks. In the dawn of the Space Age, NASA undertook to find and assemble the very best images of the Moon it could find. In a project led by Gerard Kuiper, the best telescopic plates from observatories around the world were assembled into one compilation. This Atlas is considered the definitive reference manual to the global photographic coverage of the Moon. The images contained within the atlas are excellent for studying lunar morphology because they were obtained at low to moderate Sun angles. Understanding of disks in general can be enhanced by understanding the dynamical processes observed at close-range planetary rings. We review the known ring systems of the four giant planets, and the prospects for ring systems yet to be discovered. This guidebook provides a trail-oriented geological tour of the Barringer Meteorite Crater, Arizona. The geological processes involved in the formation of the crater have been broken down into a series of discrete topics. The knowledge gained through space exploration is leading to the new science of comparative planetology. This book outlines the geologic history of the terrestrial planets in light of recent exploration and the revolution in geologic thinking. Lunar Stratigraphy and Sedimentology is an attempt to organize some of the information now available about the sedimentary rocks forming the lunar crust in a way that allows some comparison with the terrestrial sedimentary environment. The excitement of the Apollo program was that it accomplished a bold leap from the surface of the Earth to the Moon. The deed challenged our technology and engineering skill. Preparations are being made now for another and even more daring leap. The technical triumph of manned landings on the Moon and the return of samples from the lunar surface has provided scientists with a unique opportunity to advance our understanding of the nature, evolution and origin of the solar system. Don Wilhelms was a member of the Apollo Scientific Team. In this book he describes his role, along with his colleagues, during the Apollo explorations of the Moon. He presents a brief history of the theories associated with the origin of the moon. The 1964 Lunar Orbiter program consisted of the investigation of the Moon by five unmanned spacecraft. Its objective was to obtain detailed photographs of the Moon. This document presents information on the location and coverage of all photographs. A detailed introduction to impact processes, crater formation, and shock metamorphism. The book is intended for geoscientists of all kinds: students, professors and professional geologists who may encounter an impact structure in the field area. Flattened disks of cool dust and gas are found around almost all low mass stars shortly after their birth. This review addresses observations of the outer parts of protoplanetary disks with a focus on recent infrared and (sub-)millimeter results. The book presents in a readable, yet soundly scientific, language a popular account of eclipses of the Sun and Moon, and very briefly of certain kindred astronomical phenomena similar to those which operate in connection with eclipses. Contents: History; Dynamical Constraints; Geochemical Constraints; Geophysical Constraints; Theories and Processes of Origin: Lunar Formation Involving Capture or Fission; Lunar Formation Triggered by Large Impact; and more. The origins of chondrules are fundamental problems of most stony meteorites and some planetary surface samples. The contents of this volume are designed to provide the reader with a broad overview of current ideas in this area of research. The theme of this book is the study of basaltic volcanism on the terrestrial planets as a stage in planetary evolution: to use the eruption of lava from the interior of a planet as evidence of the thermal and chemical processes of the planet. An introduction to the theory of the formation and early evolution of planetary systems. Topics covered: the structure, evolution and dispersal of protoplanetary disks; the formation of planetesimals, terrestrial and gas giant planets; etc. Published in 1984 after several years of photographic analysis, this book presents maps of the six Saturnian moons which were investigated by the Voyager 1 and 2 spacecraft during their flyby missions of Saturn in 1980 and 1981, respectively. A comprehensive history of this surprisingly significant scientific discipline. Quite rigorous and systematic in its methodology, To See the Unseen explores the development of the radar astronomy specialty in the larger community of scientists. A realistic attempt to reconstruct the early history of the solar system. The authors chose a procedure which reduces speculation as much as possible and connects the evolutionary models as closely as possible to experiment and observation. A comprehensive image collection of rock breakdown features observed on boulders. This atlas is intended as a tool for planetary geoscientists and their students to assist in identifying surface features found on rocks on planetary surfaces. This page presents a vivid adventure unfolding the splendor of the Sun, planets, moons, comets, asteroids, and more. Discover the latest scientific information, or study the history of space exploration, scientific facts, graphics and videos. This course discusses the fundamental aspects of atomic and molecular spectra that enable one to infer physical conditions in astronomical, planetary and terrestrial environments from the analysis of their electromagnetic radiation. Sheehan offers an accessible history of the men who collected data about Mars and interpreted it. The central story is the coherent and compelling narrative of Giovanni Schiaparelli, Percival Lowell and the description of the 'canals' of Mars. This 1400+ pages book covers the very rapidly growing area of star-and-planet formation and evolution, from astrophysics to planetary science. It is most useful for researchers, graduate students, and some undergraduate students. The purpose of this course is to educate you on the basic science behind our exploration of the Solar System so you may make informed choices as future/current voters on issues of our environment and the future of science in this country. The book on the planet's origin, its metal-rich composition, its thermal and geophysical evolution, and its cratering history. These topics are complex and controversial, and this book contains a variety of new perspectives on them. Parts of the solar system that are most accessible from Earth are rich in materials of great potential value. Immediate uses of these resources to manufacture propellants, metals, and fluids can support future large-scale space activities. The text covers principles of planetary photometry: radiance and the equation of transfer, diffuse reflection and transmission, albedo, scattering and absorption, net flux and exitance, and a brief history of the Lommel-Seeliger law.